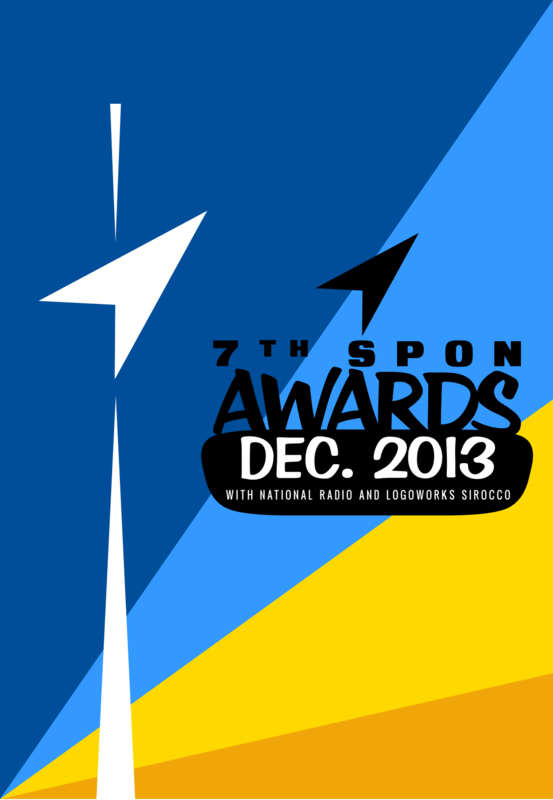 THE BEST OF 2013: The winners of the seventh annual Spon Awards have been announced with some surprising results. Alston, CA, Dec 21 – Sirocco’s annual awards ceremony was held today with the nation’s oldest tradition celebrating its seventh occurrence. The Spon Awards, a collection of awards for excellence in media, technology, typography, and for the first time this year, micronationalism and the Internet, is held in Alston every year and has become an event eagerly looked forward to in Sirocco at the end of each year. The 2013 Awards are notable for including micronationational and website categories, second places, and corporate sponsorship for the first time. Many notable Siroccan companies, such as the Institute for Scientific Research (ISR), National Post and Telegraph (NP&T) and Dominion Chocolate, threw their backing behind the awards when they were announced earlier this year. The Awards’ core awards, Song of the Year, Game of the Year, Film of the Year, and Font of the Year, returned alongside newer awards such as Anime of the Year and Video of the Year, and within this year’s ceremony there were a few surprises. 2K Czech’s 2010 game Mafia II had been expected to win the National Centre of Computing’s Game of the Year award for its 1950s setting, but was outmanoeuvred by Valve’s 2007 offering Team Fortress 2, which judges praised for “its humour, its simplicity, and its fun factor despite the concept of kill or be killed”. Mafia II was a step in the right direction, the judging panel said, but fell agonisingly short of an award due to the limited environment of the Empire Bay setting. Despite this, the game was given an honourable second place, which the panel said was only a very narrow defeat for a well-rounded game. Online game-buying service Steam won the ISR’s Program of the Year award for its large range of games and its sales, which range anywhere from 5% to 90%, such as the current Holiday Sales. Taking second place was file-sharing utility DC++, which was praised for its ease of use. Trade Gothic took LogoWorks Sirocco’s Font of the Year award, with the judging panel noting its wide adoption in Sirocco this year. Futura came a second close, but was noted for being somewhat bland against Trade Gothic’s 1950s appeal. Another of this year’s surprises came in NP&T’s Film of the Year Category, which saw 1963 comedy It’s A Mad, Mad, Mad, Mad World trump 2013 zombie action film World War Z. While World War Z was noted for its strong performance all round, judges noted It’s A Mad, Mad, Mad, Mad World‘s timeless appeal and happy atmosphere. Other films, such as The Atomic Café and Monty Python and the Holy Grail also fell just short of the mark. The SBC’s Show of the Year award was contested by only two candidates, Futurama and New Zealand comedy Seven Periods with Mr. Gormsby. Futurama was picked for the award for its “cutting commentary on the modern age despite being set a thousand years into the future”. Anime series Free! beat 2013 favourites Shingeki no Kyojin (Attack on Titan, SNK) and Hetalia to take the Siroccan Tourism Bureau’s Anime of the Year Award. A close fight between Free! and SNK was resolved after SNK was noted for being somewhat depressing against Free!‘s happier setting. Like the SBC, Fern Tree Studios found itself with only two contenders for its Video of the Year award, with 5secondfilm’s Grown Men are Talking video beating Nutella Trap, a short Vine video depicting teenage girls being captured by leaving out a jar of Nutella. Grown Men are Talking was praised for its silliness “befitting any 5secondfilms effort” and sly references to 1994 hit film The Shawshank Redemption. Dominion Chocolate sponsored the new Website of the Year award, which went to blogging site Tumblr for its broad basis of material. Popular atomic-age blog The House of Googie, planned to be expanded into a physical museum in Sirocco, was the deciding factor, with the blog alone managing to push Tumblr ahead of second-place contender WinWorldPC. The oldest and most famous award, National Radio’s Song of the Year, was saved for last. With sixteen contenders ranging from 1959 to 2013, a tough call was made for a year judges noted for “the discovery of excellent music that shall be enjoyed in Sirocco for years to come”. Reg Owen’s Manhattan Spiritual won the award convincingly, with the judging panel noting its continued appeal in Sirocco, rather than a short burst. Exile’s Kiss You All Over, Crosby, Stills and Nash’s Southern Cross and The Ready Set’s Give Me Your Hand all came very close, with Exile taking second place. After a short break, the ceremony reconvened to announce the most coveted award, that of the Spon Award for Excellentness, awarded to an award winner that had the biggest impact on Sirocco in 2013. While Team Fortress 2, Trade Gothic and Steam had a large presence in Sirocco, the award was given to Manhattan Spiritual for its popularity and almost daily playing on Siroccan radio. Manhattan Spiritual‘s victory is the first time a song has won the award, although 2007’s sole award-winner, Jerry Martin’s Power Grid retroactively won the award de facto. This year’s awards were the first since 2010 to be held earlier than 30 December, with the 21 December date returning to the unofficial tradition of holding the awards one day later than the year before. The 2008 awards were held on 18 December, with 2009 held on 19 December and 2010 held on 20 December. The Spon Awards are notable for not restricting its nominations to the year it is held in. 1959’s Manhattan Spiritual is now the oldest winner of a Spon Award, with many other awards over the years being given to content from the 1970s through to the 2010s. Boldface denotes the 2013 award winner. Italicisation denotes runner-up.